AKC and UKC registered. 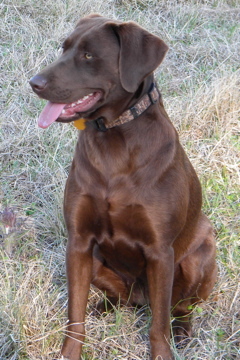 Storm is a dark chocolate female from field trial and hunt test bloodlines. She is an intelligent, beautiful 68 pound dog. Storm delivers to hand naturally and has excellent marking ability. She was also professionally trained for upland hunting. She loves the water and loves to hunt. Storm earned a Field Champion (F.CH) title which is honored by UKC and will appear on her UKC pedigree.